November isn't over yet... My guess is they were running late with the DS Kotor toons and had to push them out now to be able to bring the Darth Malak/Darth Revan legendary in February. That probably delayed a possible GG or Mace rework. Let's see, we still have 2 weeks left. 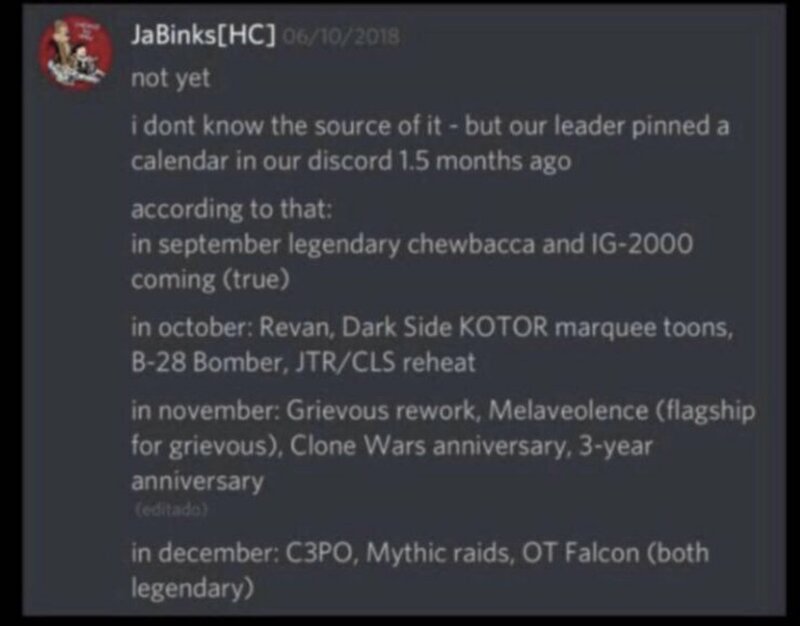 While you're correct on November not being over yet, they pretty much confirmed no GG rework and alluded to nothing Clone Wars being added this quarter. Would be AWESOME if that was just a ruse to throw us off and they will do the Clone Wars stuff and the 3yr anniversary stuff at the same time. But that would be too fantastic. I've learned to curb my enthusiasm. Fairly certain we are getting 2 more dark side KOTOR toons and maybe a possible HK47 rework, but that's it for November. This November has definitely been a major let down. Hope they turn things around for December. I'm hoping it was just a dramatic scheduling switcharound. I guess CW gets a rework or new toons when Season 7 airs (end next year). I just don't want to wait so long. What is the major issue with the leak? How does knowing a toon will come in a certain month actually affect your average player? If someone told me now that e.g. Darth Revan was coming in February id simply be excited for February. I don't see how I can use it to break the game. It would be nice if there was some Clone event similar to Ghosts of Dathomir where you'd get some extra clone shards every so often. Heck, it would be nice if they did that for a lot of the factions. Well we are probably getting Ep4-6 stuff so people will like that but they will still be negating Clone Wars stuff. So it'll still feel like missed opportunity. Yeah, and that's way too long. They could easily rework some stuff NOW and add a few new characters here and there so they can make money. And then next year roll out that "new" Clone squad as marquees. Gotta agree, it does seem very odd. Like they decided to throw a 40th birthday for Bob, and then during that bash there's napkins and plates that say "Happy Retirement Frank," and Bob gets a little cupcake with a candle while Frank's making a touching reflection speech on his career. So count me in as one who's hoping that it's not over yet. The bonus shard event was a bit of a letdown, clone helmets were cosmetic, and the TW buffs are pretty much a non-event since no one is nuts enough to do a full Sith wall (unless they missed the memo). I'm also guessing that Mace and Grevious will not get a rework until after the last TW event where they're uber-buffed (not that it would really matter, but still). I'd really like to see a zeta on Grev, Mace and Kenobi, and another clone or two, like they did with Logray and Paploo for ewoks. Stop posting stuff like that. It makes my wallet hurt. I'd let my wallet take a hit. If all this stuff actually happened it would've been a GREAT ending to the year. But the seemingly skipping of the Clone Wars stuff is garbage. The timing for this is something we will never receive again for the duration of this game’s life, and it seems that the stars aligning are being ignored. The road ahead mentioned many things that people are very pleased about, myself included, but it left out possibly the single most requested event in this game’s history. Grievous and mace have been worthless trinkets that many fans have painstakingly collected, with the only silver lining being a vague promise in the near future of a rework. It seems now that we’re running out of near futures. 2019 will be a massive year for Star Wars, with the emergence of the mandalorian, Star Wars resistance, and Star Wars IX. I am very worried that if this opportunity is passed up now, we will never get another one again, at least not for another year. Please, just confirm or deny that this will ever happen. Since 2016 I’ve been putting together small pieces of information and getting my hopes up, only for them to be shattered by reality. I’m tired of it. I’d be happier to know that you just plan on leaving grievous and mace as is than to build up more expectations over the course of another year. Please see reason. I know the devs have read this. Response? You are spot on with this take. Im very disappointed. I was super hype about clone wars reworks and content. And nothing. Their events making a appearance. Everyone in this thread is making some fantastic points that need to be addressed by the devs. We are the customers asking questions and we should be getting answers. Get a community manager that can talk to the community. If you think about it though, the “light stuff” that was done like Anakin’s ship and Clone Helmets were a fan-service for the anniversary, and the real reworks and new content are probably coming with the new CW season that’s starting up soon. Grevious love is real in here. Totally agree with most of you actually. Except kenobi zeta... while i agree with the notion that, as an iconic character, he should have a zeta... introducing a zeta right now would have to make his kit stronger. His kit does not need to be stronger. I'm actually just happy that you can max out such a strong character with omegas. I agree with the original post tremendously! I've been playing this game and coming on the forums for almost 3 years now! I've seen countless ideas come and go on here that had MAJOR community support, but never got developed or introduced into the game and were absurdly ignored. This is a HORRIBLE business tactic. I mean, I know they're doing well and making money, but they could be doing so much better! - character kits for new characters such as Snoke, Flametrooper, Shaak Ti, Droideka, Darth Plagueis, Pong Krell, Padme, etc. (given, we've seen other highly desired characters enter the game such as Bossk, Aura Sing, Talzin, R2D2, Luke, Revan, Jango, etc.). - Death Star ship raid (or a ship raid in general). - personal/individual character story modes. - And many requested faction passes and reworks such as separatists, clones, clone wars era jedi, ships belonging to these factions, capital ships, etc. - New TW/TB maps and bonuses (they've started this with Mace, Grievous, CUP, and Dolly bonuses, but the battles take place on Jakku which makes no sense lore-wise). I've been very impressed with CG/EA at times with communication (although, that's been heavily lacking lately), clarification, reimbursements, apologies, hype, etc. But It boggles the mind that they let so many of us down with no new clone wars era stuff and the other things we've been asking for. I mean, they know they will get a lot of money with clone wars faction passes, ship raids with new ships introductions, etc, yet they continue to do things that nobody has asked for at times. We've recently got many great things and I've been very happy lately, but a large portion of the community here is asking the candyshop for a king size chocolate bar but they keep giving us jolly ranchers with some bite size chocolates to sample. If they did exactly what the forum asked, then not only would they still make money, but there would be more faith restored in the devs and even more people would stay dedicated to this game longer. Give us the chocolate bars we ask you for! We have the money to pay you for it! We're sick of these jollly ranchers! hahahaha that was a good one!!!! You either do it all at once or you don't do it at all! the clone war celebration ? what celebration new art , and stingy on shard drops for the bonus? Yeah, and those were welcome. But I would hardly call that "celebration" worthy.